Department of Computer Science, University of Vigo, Ourense, Spain. Received August 11th, 2011; revised September 12th, 2011; accepted September 22nd, 2011.
round-background segmentation and create a feature vector for discriminating and tracking several people in the scene. and state space estimation algorithms. such as falls or excessively long periods of inactivity . enter a critical phase, necessitating costly emergency care. something about what these objects are doing. 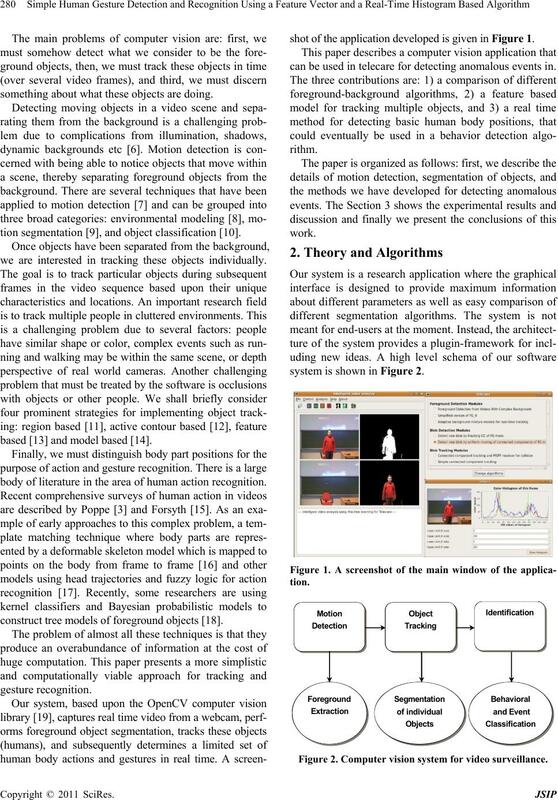 tion segmentation , and object classification . we are interested in tracking these objects individually. based  and model based . 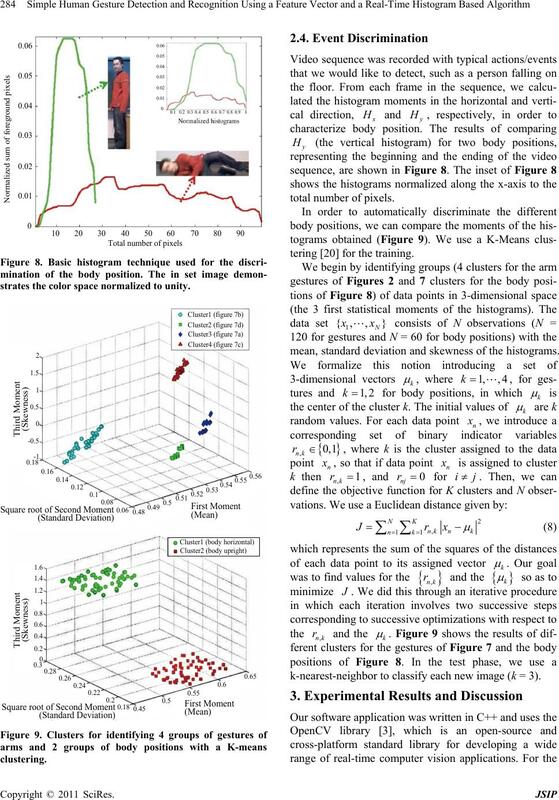 body of literature in the area of human action recognition. construct tree models of foreground objects . shot of the application developed is given in Figure 1.
can be used in telecare for detecting anomalous events in. system is shown in Figure 2. Figure 2. Computer vision system for video surveillance. position in the image, color space, and velocity vectors. assified to belong to a particular class (Figure 3). and “Gaussian mixture model (GMM)” (third row). scheme is applied. It is based upon selective updating. a small value of weighting parameter. frame in a video sequence.  is the covariance of the component. model which matched and 0 for the remaining models. After this approximation, the weights are renormalized. defines the time constant which determines change. tested with 8 values of variance between 1 and 5.
don’t contribute to the object color histograms. vectors by the number of pixels. between blobs for each color space. with only the normalized color histograms. match all these rectangles with the previous frames. plex depth information must be obtained. Figure 5. The feature vector parameters for classifying blobs. video events were recorded, as shown in Figure 7.
and the histograms of these figures. the moments of each histogram. both by bins and by total number of points) are obtained. Figure 7. Simple histogram results for detecting arm gestures. strates the color space normalized to unity. mean, standard deviation and skewness of the histograms. k-nearest-neighbor to classify each new image (k = 3). without the need for rewriting source code. were obtained from webcam with 2 M Pixel resolution. our examples in the previous section. in order to have a ground truth quantitative comparison. webcams constantly adapt to illumination changes. 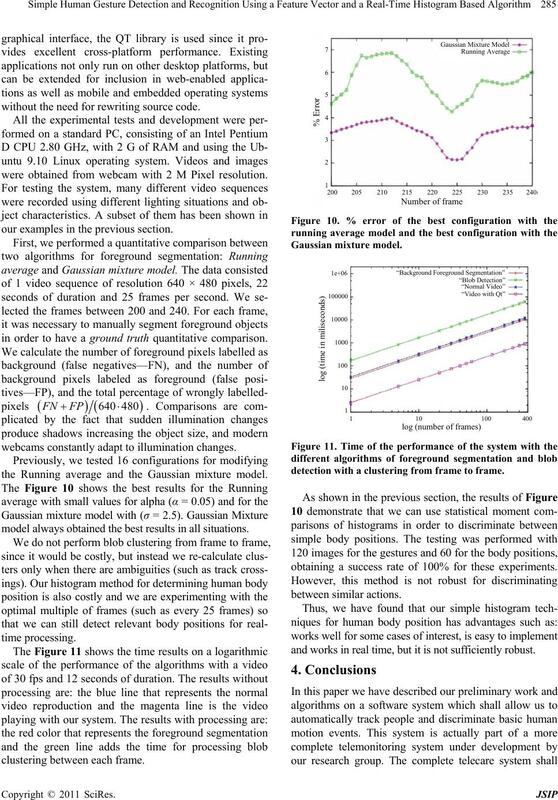 the Running average and the Gaussian mixture model. model always obtained the best results in all situations. 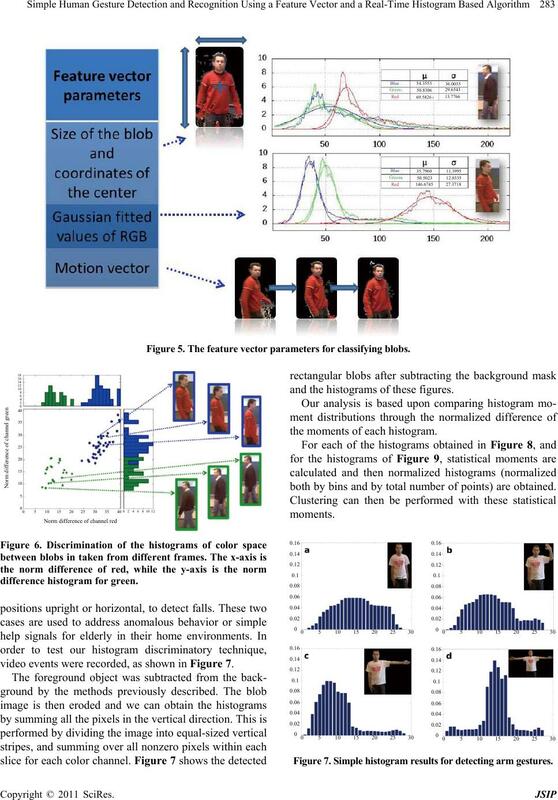 detection with a clustering from frame to frame. obtaining a success rate of 100% for these experiments. and works in real time, but it is not sufficiently robust. methods in order to obtain a more robust tracking. should have utility in real systems . venia), Vol. 33, No. 2, 2009, pp. 197-204.
age Understanding, Vol. 113, No. 3, 2009, pp. 345-352. 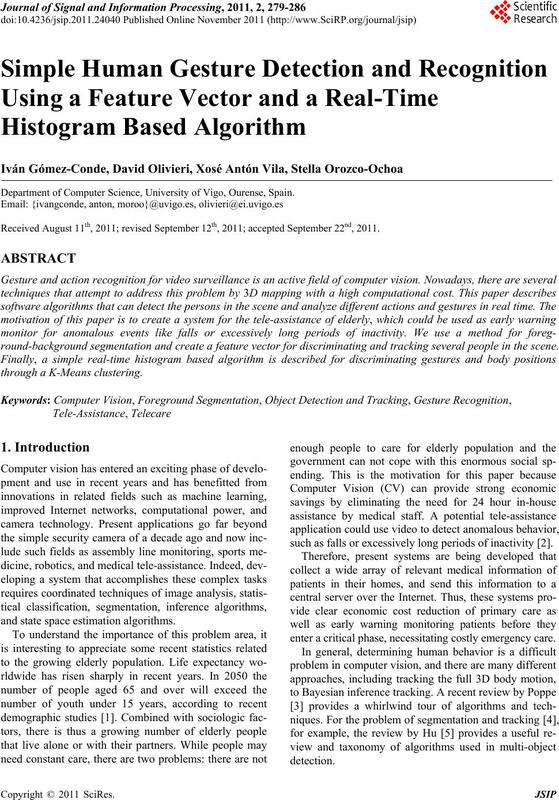 Recognition,” Image and Vision Computing, Vol. 28, No. 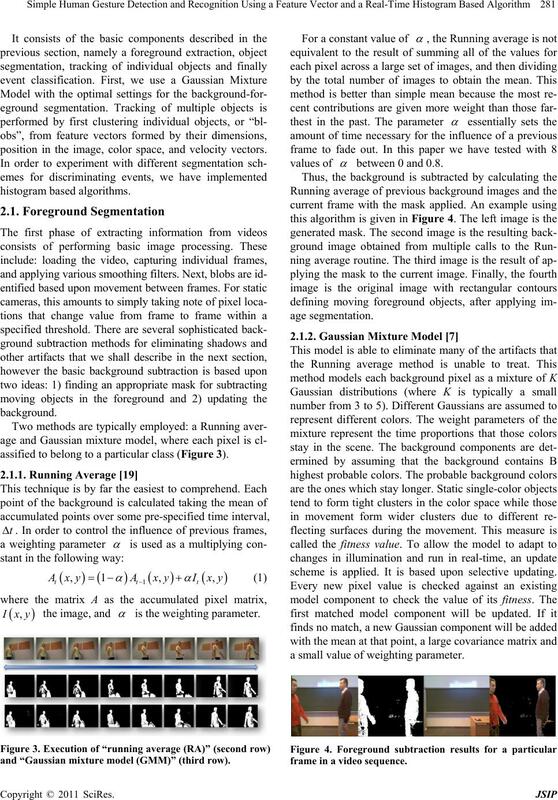 C. Sandoval, A. Albiol, A. Albiol, V. Naranjo and J. M.
on Image Processing, Vol. 2, 2003, pp. 379-382.
wer Academic Publishers, September 2001, pp. 1-5. A. Elgammal, R. Duraiswami, D. Harwood and L. S.
Vol. 2, 2004, pp. 302-309. Image and Graphics, Xi’an, 20-23 September 2009, pp. essing, Vol. 13, No. 4, 2004, pp. 518-526.
veillance, Beijing, October 2005, pp. 349-356. D.A. 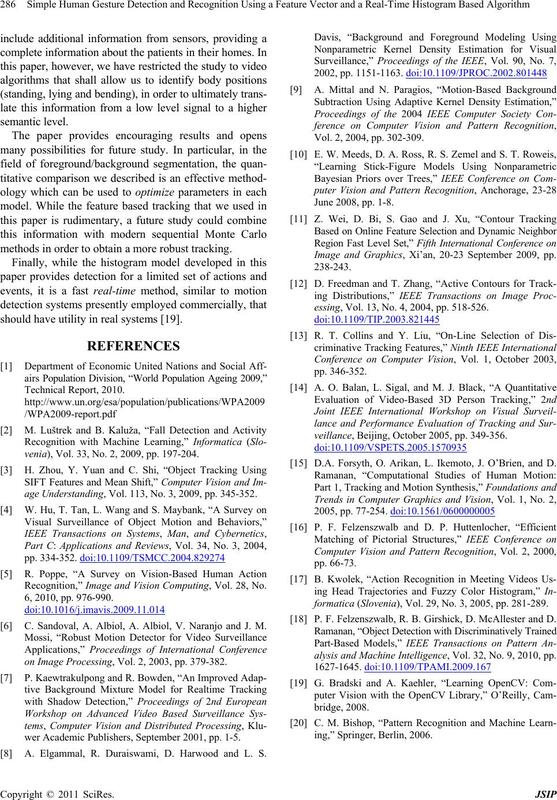 Forsyth, O. Arikan, L. Ikemoto, J. O’Brien, and D.
formatica (Slovenia ), Vol. 29, No. 3, 2005, pp. 281-289. 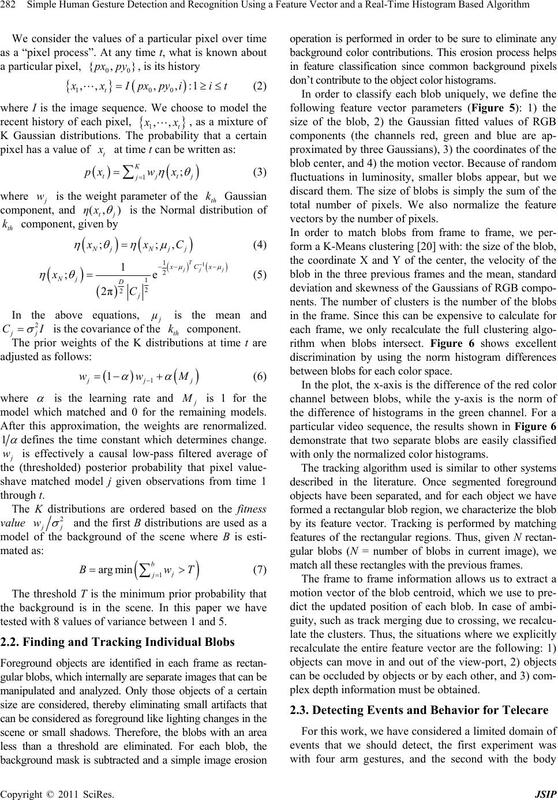 P. F. Felzenszwalb, R. B. Girshick, D. McAllester and D.
alysis and Machine Intelligence, Vol. 32, No. 9, 2010, pp.